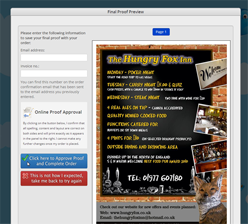 We have developed the most amazing software to make online print ordering SIMPLE. When ordering from Cheapestprintonline.co.uk, you don't need to be a qualified graphic designer and understand all the 'print ready' jargon - with our new FILE PREVIEW SOFTWARE you can create you own design on your own computer and simply upload almost ANY FILE TYPE to our website and proof it there and then on screen so you see exactly what you will get. 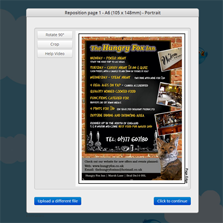 You can resize, rotate or crop your image on-screen until you're happy. Our software will also convert all your colours to a printable format (CMYK) - the conversion between CMYK and RGB will change the colours slightly. 1 : Make sure your text is inside our 'safe area' otherwise it may get cut off. 2 : If your design has a background image or colour, make sure you have full 'bleed', otherwise your print may have ugly white slithers. 3 : Make sure your design is the same size as your order and the size you choose to upload at the end. If it doesn't fit, drag the corners in our editor to resize it. 4 : Don't use borders to the edge of your design and you keep all your important details inside our 3mm 'safe area' (If you use a border, you may end up with lopsided print - so avoid them where possible. 5 : If your design looks blocky on screen, this is how it will print - you need to get a higher resolution version of your artwork. If in doubt, try zooming in on your design and see if it still looks clear. 6 : If you use our downloadable templates (found below), make sure your photos/ images go right to and past the edge of the page - into the 'bleed' area, to avoid unsightly slithers when cut. Also, we know it is obvious, but REMEMBER to delete the template before you send the file - if it's on your design, it will be printed! 7 : If you are supplying solid blacks, please use a black make up with a 'shiner' of Cyan = 60%, Magenta = 60%, Yellow = 0% and Black =100%. Also note that any tint less than 5% may not show up on the print. 8: If you are using Yellow in your artwork, please check your proof carefully after your upload as the conversion can result in a 'green tint' to your yellow. If this is visible, do NOT approve your proof to print. 9. Please be aware that printed colours do not match colours shown on your screen/monitor due to the difference in RGB and CMYK processess. 10. All files should be provided as SINGLE pages (i.e. not spreads) so our software can imposition them to our specification. As a result, files not provided as single pages may be printed incorrectly. Unlike all of our competitors we no longer ask for your file to be provided in a certain, strict way. We have now developed our own FILE PREVIEW SOFTWARE which simply lets you upload your file and resize, rotate, crop and preview your image on screen before sending it. This clever software will also detect if your images or text are too close to the edge and will reduce your image to fit within a safe margin if necessary. So thats pretty much all we ask - check your image online with Cheapestprintonline and our File Preview Software! 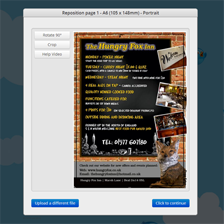 Generally, any file can be handled in our conversion software if you can save / print / export the image into a .PDF. The above file formats are all acceptable - all we ask is you try to keep any images to a resolution of at least 300dpi and convert any gradient or patterned background or complex fonts to bitmap images before sending. 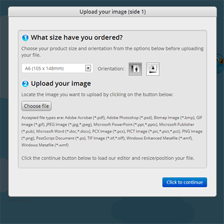 1) Choose the size you ordered, orientation and upload your file. 2) The preview page. Anything outside the black edge will be cut off, so drag the sides to adjust the shape of your image or crop/rotate if you need to. 3) The Crop page. Too much extra on the outside of your image? Just drag the sides inwards to crop. 4) The Proof page. This is how your file will look when printed. Not quite right? Just click the red box and go back and try again. You can still use our templates to help with your design.. Always remember to remove the template after you have used it for your design - unless you want our logo printing! * Illustrator and Photoshop version 8 or newer. All our downloadable templates are saved as .ZIP files that can be opened with WINZIP, WINRAR or STUFFIT.